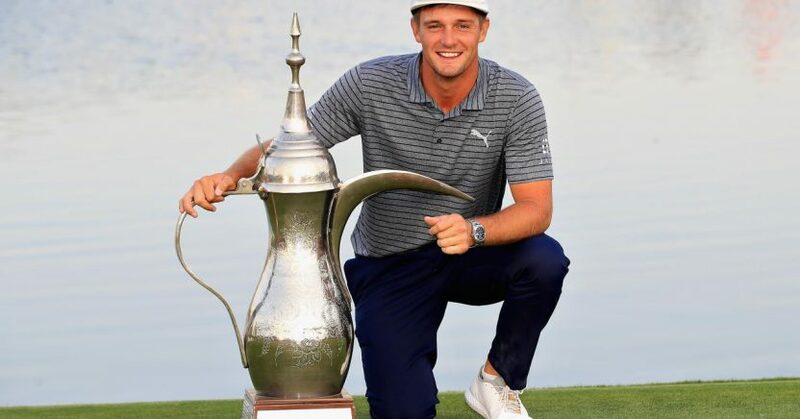 American Bryson DeChambeau claimed his maiden European Tour title in style on Sunday, producing a closing 64 to win the 30th anniversary edition of the Omega Dubai Desert Classic by seven shots. The world No.5 had set himself the target of securing his first professional overseas win at Emirates Golf Club ahead of the event, and he duly delivered, carding an eagle, seven birdies and a single bogey on day four to finish the week on 24 under par and set a new tournament record. Last year’s champion Li Haotong, who played alongside DeChambeau in the final round, had held the previous record after producing a winning score of 23 under in 2018. Li recorded a closing 73 to finish tied for 12th, after being controversially given a two-shot penalty on the final hole for being deemed to have been lined up for a two-foot putt by his caddie. Matt Wallace finished alone in second place on 17 under after closing a 68, while Paul Waring, Ian Poulter, Sergio Garcia and Alvaro Quiros shared third. DeChambeau came into the final round with a one-shot advantage over nearest challenger Li, but soon set about increasing that lead, holing his birdie putt from 20 feet at the first before making another gain at the second. He then continued his perfect start to the round with another birdie at the long third from close range to get to 19 under par. DeChambeau created more chances on the front nine, but had to settle for six more pars to reach the turn in 32. The 25 year old extended his lead further as he began the more scorable back nine, holing his ten-foot eagle putt at the long tenth before picking up a birdie at the 11th to move to 22 under and open up a six-shot lead. He dropped his only shot of the day at the 12th but bounced back with a birdie from eight feet at the long 13th. DeChambeau then holed his six-foot birdie putt at the 14th to jump to 23 under. After coming agonisingly close to picking up further shots at the 15th and 16th, he rolled in from six feet at the 17th for his seventh birdie of the day. And he finished his round with a par at the last to win by seven strokes. Bryson DeChambeau: What’s In The Bag? Wedges: Cobra King V Grind (50°), Cobra King WideLow Grind (55°, 60°) 37.5-inches.